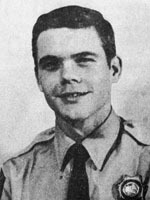 SCVHistory.com | California Highway Patrol: The Newhall Incident. From the California Highway Patrol | n.d. The words "Newhall" and "tragedy" became forever synonymous on April 5, 1970*. 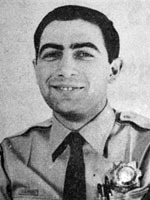 On that day four young California Highway Patrol officers lost their lives in a 4-1/2 minute gun battle that left four women widows and seven children, ranging in age from 9 months to 4 years, without fathers. 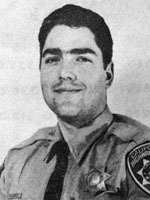 The tremor that rolled through the CHP  and in fact, all law enforcement  spoke of grief for lost comrades and their suffering families, of organizational concern with the urgency of rethinking high-risk stop procedures, of humility imposed by such a catastrophic event, and then, the iron resolve to prevent a reoccurrence. The 25th anniversary of this sad day was observed in April, 1995, at the present Newhall Area office, where a brick memorial pays tribute to Officers James Pence (6885), Roger Gore (6547), Walt Frago (6520) and George Alleyn (6290). The memorial once stood at the former Newhall office, but was rebuilt at the new site, about one mile from the scene of the slayings, which occurred in a restaurant parking lot just before midnight. Officers Frago and Gore had been alerted by radio of a vehicle carrying someone who had brandished a weapon. They spotted the car, fell in behind, called for backup, and began the stop procedure. When the subjects' vehicle had come to a halt in the parking lot, the driver was instructed to get out and place his spread hands on the hood. Gore approached him and Frago moved to the passenger side. 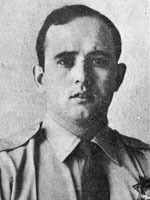 The right-side door suddenly swung open and the passenger sprung out, firing at Frago, who fell with two shots in his chest. The gunman, later identified as Jack Twinning, then turned and fired once at Gore, who returned fire. In that moment the driver, Bobby Davis, turned and shot Gore twice at close range. Both officers died instantly. When Pence and Alleyn drove in moments later, they could see neither suspects nor downed officers, but immediately came under fire. Pence put out an 11-99 call ("officer needs help") then took cover behind the passenger door. Alleyn grabbed the shotgun, and positioned himself behind the driver-side door. Both officers were mortally wounded in the ensuing exchange, and one subject was hit. Suspects Jack Twinning and Bobby Davis escaped, later abandoned their vehicle and then split up. For nine hours, officers blanketed the area searching for the killers. Twinning broke into a house and briefly held a man hostage. Officers used tear gas before storming the house, but the suspect killed himself using the shotgun he had stolen from Officer Frago. Davis was captured, stood trial and convicted on four counts of murder. Bobby Davis was sentenced to die in the gas chamber, but in 1972 the California Supreme Court declared the death penalty to be cruel and unusual punishment and in 1973, the court modified Davis's sentence to life in prison. For many years, he was incarcerated at Folsom State Prison, but was last known to have been moved to Pelican Bay State Prison, the home of California's most notorious criminals. In the weeks immediately after the four deaths, the emotionally charged follow-up investigation sometimes lingered on fault-finding, but ultimately achieved the desired catharsis  a completely revamped set of procedures to be followed during high-risk and felony stops, with emphasis at every step on officer safety. If there can be such a thing as a silver lining in a cloud this dark, it would be the renewed focus on officer safety  a concern still uppermost even thirty years later. Firearms procedures have changed fundamentally, physical methods of arrest have been perfected, the police baton has become a more integral element of enforcement tactics, and new protective tools (such as pepper spray) have become part of the officers' standard equipment. Along with these have come far more comprehensive training  all combining to make uniformed personnel more alert and better prepared for the inevitable dangers faced by CHP officers. At the 1995 memorial ceremony, family members and colleagues of the dead officers joined dignitaries and Highway Patrol officers who didn't know the four men, but whose lives have been influenced by that fateful night in 1970. Officers Walt Frago, Roger Gore, James Pence and George Alleyn will live forever in that special place of memory which the Highway Patrol reserves for those who have given their lives while on duty. These four remain unique, because their memories evoke a sorrow never quite put behind us, and the knowledge that their sacrifice ultimately made the Highway Patrol stronger, wiser, more resolute. * Note: The date of April 6 was originally used, but the incident began shortly before midnight on April 5 and all four officers were dead by 23:59:00 that night. The incident carried well into the next day.